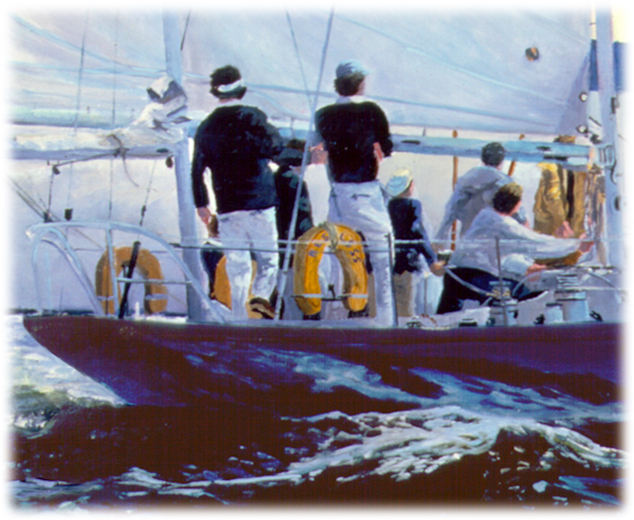 Part of the One-Design Series, a painting of a Naval Academy Yawl out for a day. Exhibited at the “Of Ships and the Sea Exhibition” at Greenwich Workshop Gallery and sold by their director Graham Stiles to the John Nuveen and Company. Purchased for a board room piece to demonstrate teamwork for the New York office. Original was 24×42 on canvas. Tags: canvas prints, giclee print, giclee prints on canvas, marine art, nautical art, Naval Academy Yawls, one-design racing, sea paintings, wall art, water painting, yacht portrait. Restless Dreams is part of the One-Design Series of Yacht Portraits, a painting of a Naval Academy Yawl out for a day. Exhibited at Greenwich Workshop Gallery, Wall Art. Ten years of painting every one-design in existence, exhibited at the Mystic Maritime Gallery, Greenwich Workshop Gallery and Annapolis Marine Art Gallery. Portraits included everything from the smallest Penguin to the largest America’s Cup Yachts. For special requests contact us through this site. This is an amazing painting, full of movement and light. Absolutely spectacular.